Genjo! is a language learning assistant, that's designed to be simple to use, yet very handy. The idea is that you can get a dashboard-like view of your language learning process that will help you stay motivated to achieving your goals. It also gives you a great way to record your progress over a set period of time, this itself is great motivation, and it's fun to look back at how far you have come. The Genjo! home page combines the three major elements of the application together into an easy-to-read dashboard like page. These three major elements are diary entries, targets and tasks. One of the most challenging aspects of learning a foreign language is absorbing the grammar and volcabulary that you are learning. It can often feel like new information or grammar rules go in one ear and straight out of the other. Genjo! is designed so that it's incredibly easy to make a quick diary entry in your target language. If you set a good routine of writing a diary entry every day, you can really help your brain to remember and absorb the new information that you are trying to process. Also, these diaries can be great motivation in the future when you look back at them, as you will be able to gauge just how far your have come with your learning. To create a new diary, open the Diary screen from the top menu and then click the new button. 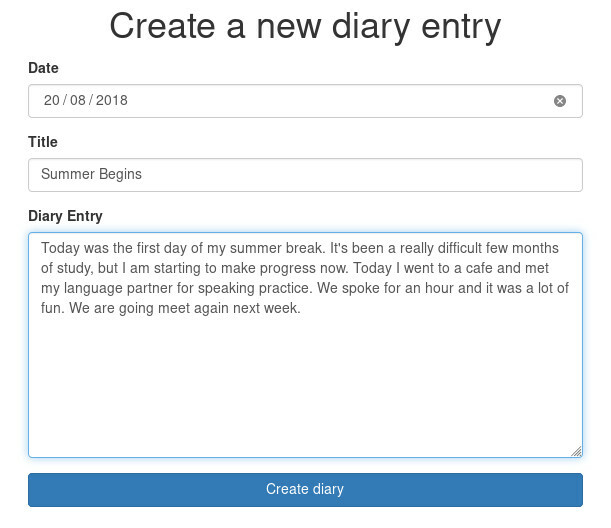 If there are no diaries yet, you will see a helpful message with a link to create your first diary. The following picture shows an example of an English language diary entry. As you can see, you can provide a date, title and the contents of the diary itself. Once you have created a diary, you can read them or edit them at any time, from the Diary screen, amongst other places. We all have targets when we are learning a language. Whether you have the aim to learn a new writing system, or pass a compentancy test, or learn a certain number of new workds. Visualizing these targets is a great way to keep you on track to achieve them. To create a new target, open the Target screen from the top menu and then click the new button. 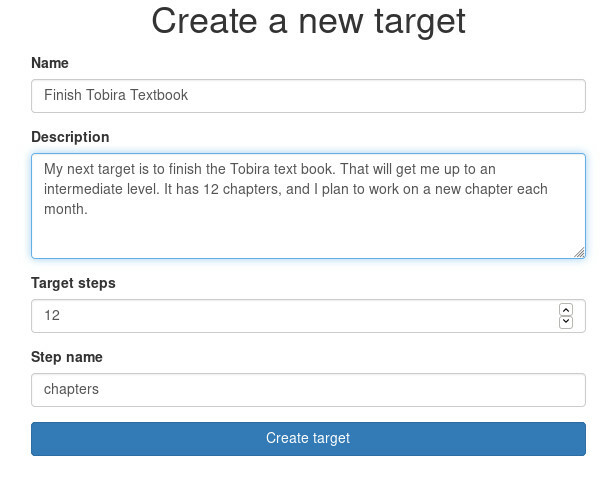 If there are no targets yet, you will see a helpful message with a link to create your first target. The following picture shows an example of a typical target a language learner might want to set up. As you can see, you can provide a name and description for the target, as well as the number of steps that the target has, and a name for the type of steps. For example, chapters, words, characters etc. Once you have created a target, Genjo! will render a progress chart of the target and show how close you are to achieving the target. You can update the amount of steps you have completed on the target by editing the target. To do this you will need to access the Target page. When you are learning a foreign language, there are often many tasks that you have have to complete in order to achieve your goals. For example you may need to review a certain amount of words each day, or buy certain materials. Genjo! helps you stay on top of all these little tasks by providing a todo list like feature. To create a new task, open the Task screen from the top menu and then click the new button. If there are no tasks yet, you will see a helpful message with a link to create your first task. The following picture shows an example of a typical task that a language learner might want to set up. As you can see, you can provide Genjo! with a name and description for your task, along with an optional due date and high priority status. 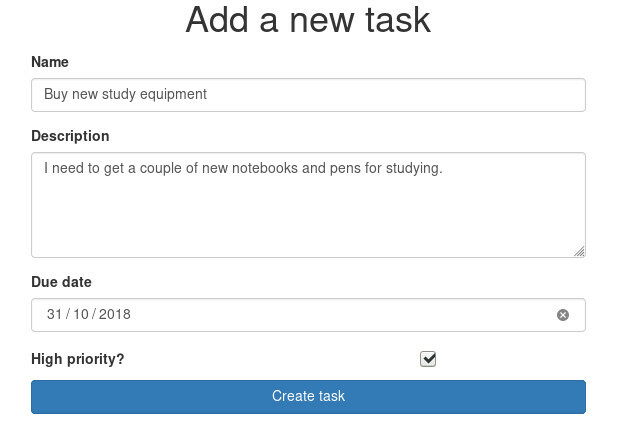 After you have created a task, you can view it on the Task page in a very easy-to-read format.